The Dark Liquidity site has been comparing the GMI based trading strategy versus a number of other strategies. For each of the last two years a strategy that bought the QLD whenever the GMI signaled buy, and went to cash every time it signaled sell beat all other strategies followed. In 2012 the GMI based QLD strategy was up about +30% and thus far in 2013 it is up +42%. I do not check that site’s computations, but my experience is that repeatedly, buying QLD when the GMI signals buy has usually worked. 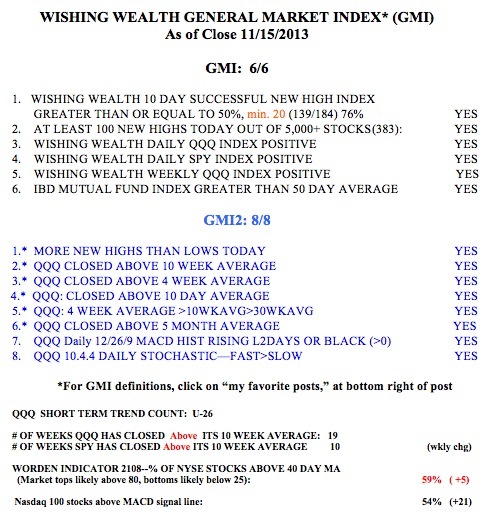 Since the last GMI buy signal on September 4, the QQQ is up 9.3%, the SPY is up +8.5% and the QLD is up 19.5%. For those willing to trade TQQQ, the speculative 3X leveraged QQQ bullish ETF, it is up +29.9% in the same period. While past performance does not guarantee future results, it is striking to me that I have found and posted similar results for prior up-trends signaled by the GMI. With that as an introduction, here is the current GMI and its components. After a down-trend, two days with the GMI above 3 signals a buy and two days below 3 signals a sell. I continue to post the GMI signals to the right of this site. I would be interested in hearing from my readers whether they have been able to trade successfully based on the GMI. For those following ONVO, it had its highest trading volume ever, 26 million shares, on Friday. With the stock going near vertical, it is very dangerous. But it did burst through its green line top! When I first posted about it when it was around $4, I warned that it was like buying a lottery ticket. It still is…..
Hello, Dr. Wish. I back-tested the GMI signal strategy last week while searching for a new strategy to trade. I back-tested the 2013 buy/sell signals and the results are impressive. I also compared it to the IBD Market Pulse buy/sell triggers. The GMI outperforms the IBD Market Pulse in two ways. First, the GMI signals kept a trader invested at times when IBD called for an uptrend under pressure and market in correction signal. For example, in 2013 there would have been 9 buy/sell transactions using the GMI trading signals. Using the IBD Strategy, there would have been 23 transactions as of 11/13/13. Second, the percentage profits far exceeded the IBD Strategy alone. So, not only does GMI outperform the IBD Market Pulse on a percentage gain/loss basis, but it also outperforms on a trading frequency basis. My results are slightly different than what Dark Liquidity reports, but not by much. 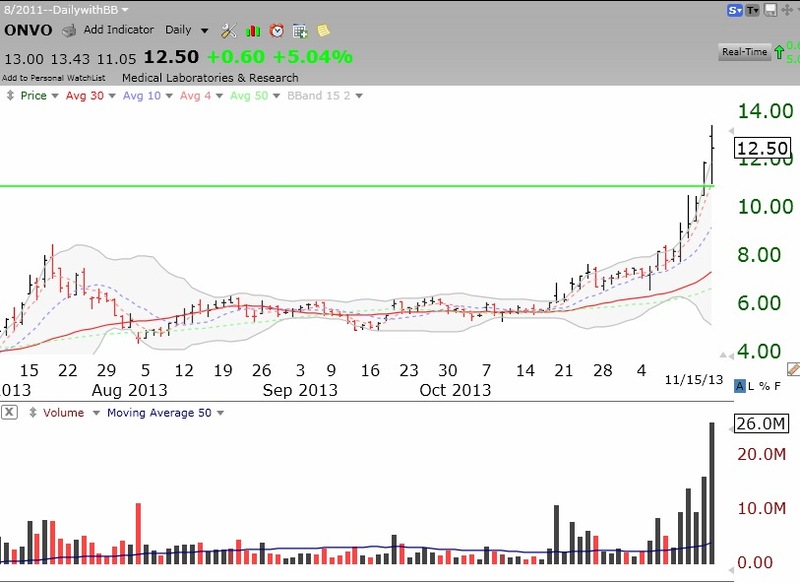 Using the QLD GMI strategy, I calculated 38% profit through 11/13/13. Using the TQQQ, I calculated a 60.5% profit. I also used the TNA ETF which generated a 77% profit. Using the IBD Strategy, as laid out in their paper with the three signals, I calculated a +14% profit using QLD. I didnâ€™t continue testing the TQQQ or TNA. I saw no point after seeing the big difference using QLD. Using the IBD ETF Strategy calculated the following QLD = +26%, TQQQ = +37%, TNA = +60%. I didn’t use any high-end software for back-testing, just good old Excel. The only downside to both systems, is if you don’t get in on a buy signal, you will be waiting a long time for another one. I have been following your blog for the last two years with much interest. I have no position in ONVO, but am fascinated by the company. I practice Emergency Medicine and I see some incredible potential … not sure if it will be realized or not, but very cool to think sbout. I saw 3D printing at CES over 3 years ago and just couldn’t wrap my head around the potential. I think the word “printing” threw me off. I’ve wished many times since that I would have invested in Stratasys and 3D Systems. Anyway, as to QLD. I have read and re-read your article entitled “The new 3X EFTs – triple your pleasure – or pain”. My impression is that these highly leveraged ETFs are best utilized by active day traders rather than the more pedestrian retail investor such as myself. However, with the GMI / QLD plan, my impression is that you build your positiion without moving in and out of it on a daily basis. Is this correct? Thanks for publishing your thoughts and research. I bought 2k of ONVO, sold 700 @9.50, sold 800 @11.20 and still have 500. Looks to me like it will consolidate for a while. I will buy more if it moves higher out of a base. I’ve been doing some research on ONVO for an upcoming article on Seeking Alpha. Amazing company! Let me know if you’re interested in reading it and I’ll send you the link. I do have ONVO in my portfolia on Seeking Alpha, so I think I’ll get this link automatically. Although I’ve been reading this blog for years, I don’t recall ever reading a definition of the buy and sell signals until today (“after a down-trend, two days with the GMI above 3 signals a buy and two days below 3 signals a sell”), so I’ve never used this blog for timing. But, I’m still confused. When you refer to the GMI in that definition, are you referring to both the GMI and GMI-2, or just the GMI? I only use the GMI for buy and sell signals. GMI-2 is just a collection of indicators I want to remember to track daily.